Hermelin company presentation video. 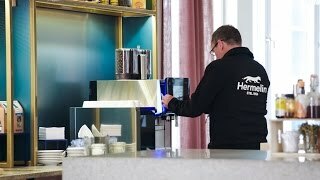 This video was shot, among other places, at our clients HTL, Kaferang and Juiceverket with Swedish latte art champion Jelle van Echelpoel. 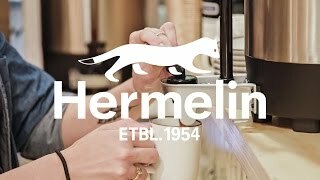 Hermelin, a Swedish company founded 1954, offers high quality, professional, fully automatic and manual espresso machines and coffee machines including filter coffee solutions, grinders and associated accessories. Our diverse product range includes everything from coffee machines and equipment suitable for the office to the specialty coffee bar, which gives us the opportunity to work with all types of customers. We also offer beverage machines for cold, frozen or warm drinks and bar & restaurant equipment from slush and granita machines, professional microwave ovens, juicers and juice extractors to votives and liquid wax fuel. Hermelin has an extensive service organization with our own service technicians based in Stockholm, Gothenburg, Malmoe and Norrkoping, combined with well trained and certified service partners around Sweden. We also service and repair products sold in the rest of the Nordics. Our product mix is focused on brands associated with the highest product quality, in which we possess great skills. We represent WMF, LaCimbali, Marco, Dalla Corte, Mahlkönig, Ditting, Anfim, Ugolini, Citrocasa, Ceado, Hollowick, Sharp and Cosmetal. We are a creditworthy company, assigned the highest rating a corporation can get - AAA, according to Bisnode’s valuation system based on a number of decision rules.